which the railway passes through. Please leave a comment on our Guestbook page. 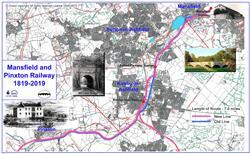 Welcome to the Website of the Mansfield and Pinxton Bicentennial Celebratory Project. The Mansfield and Pinxton Railway was approved by Act of Parliament in 1817, and work began immediately on the five arch viaduct shown below, the Portland Bridge, named in honour of the Duke of Portland, the main shareholder in the enterprise. The railway was originally a twin track built of iron rails on stone slabs, and was completed by Easter 1819. The Grand Opening on Tuesday 13th April was celebrated by a huge crowd of people, who accompanied the first load of coal from Pinxton to Mansfield market place, where the coal was ceremonially burned in a large bonfire, accompanied by the ringing of church bells. The cost of building the railway in 1819 was £35,000, but in 1847, after almost 30 years as a horse drawn operation, it was sold to the newly formed Midland Railway for little over half that amount. Steam engines were introduced at that time as the line became part of the MR Nottingham to Mansfield route. Taken over again in 1923 as part of LMS it was worked through the 20th century and the nationalisation of the railways in 1948. Closed to passenger traffic in 1964 it was then reinstated as part of the newly opened Robin Hood Line in 1993, making it one of the oldest railways in the UK in continuous use. and now a Grade 2 listed building. of construction and the enigmatic initials. the significance of either ?